The buckle which carries the mark below is slightly unusual in form and carries a George III duty mark in an oval punch, a Lion Passant Guardant in the typical pointed bottom punch of London, plus a typical London date letter "q" for 1791/1792 . 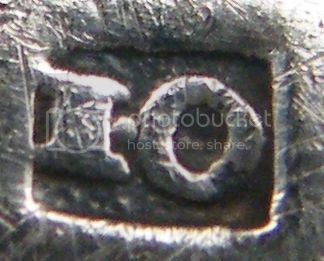 I would have no hesitation about attributing to London except that very rarely are London buckles datelettered before "r" . My mind goes perhaps to an unrecorded London mark of John Ollivant of Manchester.